UN chief Ban Ki-moon has thanked Rwanda for dropping its threat to withdraw peacekeepers from Darfur. 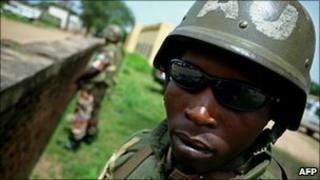 Rwanda was furious after a leaked report accused its troops of committing genocide in the Democratic Republic of Congo. The threat to the UN force in Darfur prompted Mr Ban to make an emergency trip to Rwanda earlier this month. After the leak, the publication of the report into the DR Congo conflict was delayed until Friday. This was to allow Rwanda to add its comments. Mr Ban met Rwanda's President Paul Kagame on the sidelines of the UN General Assembly in New York on Sunday. "The secretary-general said he was very satisfied to learn that Rwanda would continue its important role in peacekeeping, especially in Darfur," a UN spokesman said afterwards. The joint UN-African Union force in Sudan's Darfur region is led by Rwandan Lt Gen Patrick Nyamyumba. Rwanda has some 3,300 soldiers and 86 police serving with the force, known as Unamid. It has also some 200 troops in a separate force in Southern Sudan. When the report was first leaked, Rwanda dismissed it as "malicious" and "ridiculous" and said it would review its co-operation with the UN. The draft of the 600-page probe accuses Rwandan troops and their Congolese rebel allies of killing tens of thousands of ethnic Hutus after invading DR Congo in 1996. "The systematic and widespread attacks described in this report... reveal a number of damning elements that, if they were proven before a competent court, could be classified as crimes of genocide," it states. The accusation of genocide against Rwanda's current government is extremely sensitive as Mr Kagame came to power as the head of a rebel force fighting the regime which carried out the 1994 genocide in Rwanda, in which some 800,000 ethnic Tutsis and moderate Hutus were slaughtered. Some of those responsible fled into DR Congo, where Rwandan troops loyal to Mr Kagame, a Tutsi, pursued them. The UN report said many of those killed by the Rwandan troops were Hutu civilians, rather than fighters. Analysts say the draft report was leaked to prevent Rwanda lobbying for it to be amended before publication. Rwanda's 1996 invasion of DR Congo started years of conflict in that country which left some four million people dead and involved the armies of at least eight African countries and numerous rebel groups.